Overall war - in north and Lebanon: While northern Israel residents spent the night in shelters, several barrages of Katyusha rockets were fired at the center of the northern city of Nahariya Thursday morning. A woman in her 40s was killed after a rocket directly hit her bedroom. Another 18 residents were injured, one of them sustaining serious wounds and the rest sustaining light wounds. 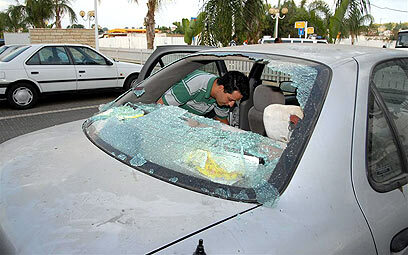 They were evacuated to the city's hospital, suffering from shrapnel and shockwave injuries. This time the rockets hit deeper areas inside Israel. Rockets fell near Kibbutz Cabri, Rosh Hanikra and Beit Hillel. Kibbutz Mahanayim and the community of Mishmar Hayarden were also hit. The Nahariya railway station and the Mahanayin airport were closed following orders issues by the Ministry of Transportation. One of the barrages directly hit a building in Nahariya, killing a woman who was in the attic. Another three apartments suffered damages. City Council member Elle Merkin-Spector, who lives in one of the buildings hit in the attack, was in the reinforced room with her husband and baby at the time. "We immediately understood we were hit by a Katyusha," her husband Arkadi recounted. "The house trembled, and although the blinds were shut, windows shattered due to the shockwave. This is the first time we experience a Katyusha so close to home. The most frightening part was the baby's unstoppable crying, and the fear that another missile is expected to arrive following the first hit." Another two barrages hit Nahariya main traffic light junction. A car was directly hit and several residents were injured in the city's main street. The residents, some of whom were planning to start the morning with sports activities or a cup of coffee on their balcony, rushed back into the reinforced rooms. The city declared a state of emergency. 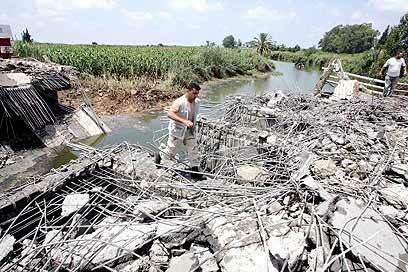 And Lebanon was also under fire: The Israel Air Force on Wednesday night struck at least 40 targets in different places across Lebanon, including bridges and infrastructures along the Litani and Wazzani rivers. Early Thursday, the IAF struck a runway in Beirut's international airport, where masses of tourists have been passing every day in recent years on their way to Lebanon's vacation sites. The airport was closed "until further notice." Another target was Hizbullah's television station al-Manar, which continued its broadcasts despite the strike. According to Lebanese sources, at least 20 people were killed in the strikes and scores were injured. The Israeli operation in Lebanon kicked into high gear following decisions made by the government, which convened Wednesday night for an emergency meeting in light of the serious escalation on the northern border, which joins the ongoing operation in the Gaza Strip. Jerusalem sees Lebanon as responsible for the "warlike act," as Prime Minister Ehud Olmert put it, and has asked to claim a heavy price from Hizbullah to make it "regret the moment," according to Defense Minister Amir Peretz. The names of the kidnapped soldiers were still not cleared for publication. The immediate aim of the Lebanon operation, like the one being conducted in Gaza, is to bring about the release of the abducted soldiers. But the IDF has been given an extensive mandate to bomb inside Lebanon and deal with the long-range rockets, which Hizbullah has deployed across the border since the IDF's withdrawal from south Lebanon six years ago. 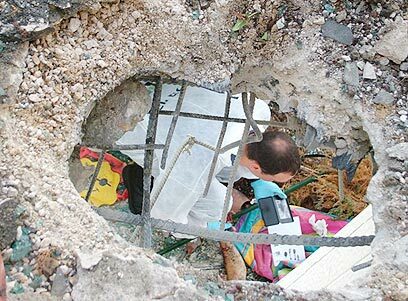 The rocket threat, which is aimed at population centers and strategic sites in the Haifa area, and which according to intelligence may even reach Netanya, has become a real strategic threat in recent years. Speaking on Wednesday, Hizbullah leader Hassan Nasrallah hinted that he prepares to use the "judgment day" weapons – the long-range rockets. Olmert, on his part, made it clear that Israel will also act at the price of rockets fired at its territory. “The Scud threat from Syria did not stop us from acting. Would anyone think we wouldn’t act because of the scud threat?” he questioned. While the Lebanon operation continues, the Israel Police has raised its alert level to the C level – one level before a real emergency state. In the northern border, residents spent the night in shelters and reinforced rooms. Several mortar shells were launched at the western area of the border, and a number of Katyusha rockets were fired at an IDF base on Mount Meron. There were no reports of injuries or damage in these incidents. See all talkbacks "Nahariya: Woman killed in Katyusha attack"